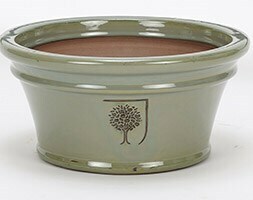 Round frost-proof glazed terracotta saucer for use with the RHS glazed pots. Prevents stains on the patio and makes a lovely finishing touch for your display. Each saucer features the classic RHS logo, along with raised ridges to aid drainage. To clean, simply wipe down with a cloth and soapy water. Finished in antique grey.